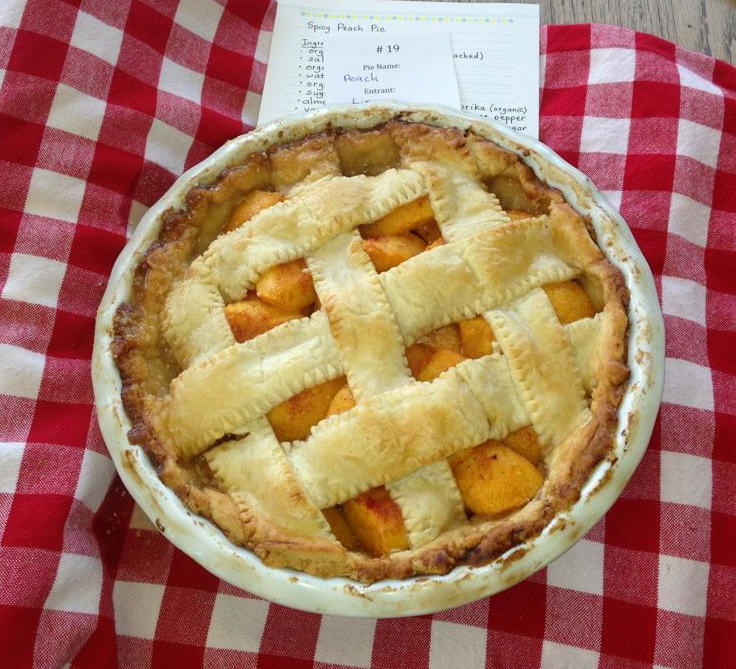 Good times with good friends ... enjoying peach pie and ice cream on a hot summer day in August! The pie baking contest was held on sunny Saturday afternoon at Mission Pie Bakery and included 20 contestants, 10 in the sweet pie category and 10 in the savory category. Being held in the foodie town of San Francisco, there was a waiting list just to enter the contest! 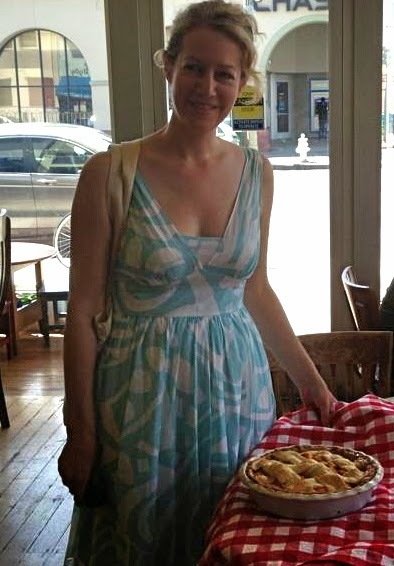 We were all super-excited to be there with our homemade pies, which reflected a wide range of tastes—from a classic chocolate tart and berry crumble to a peaches 'n cream pie. Entering my pie into the competition! Seven judges, all professional bakers, rated the pies in private and then allowed customers to weigh in with the People's Choice vote. With a sense of drama, the judges announced the winners in different categories. Best Savory Pie: the curry meat pie; Most Original: bacon whiskey fudge pie; and finally the crowning Best in Show: an apple-ginger pie with buttery flakey crust. All of my efforts to enter the contest were worth it—simply to see the ultimate award winner's reaction. He looked as if he had won an Oscar, made a speech thanking his supporters and instructed everyone to "Eat More Pie!" Below is the recipe that I developed for the contest. Enjoy! *To prepare the pie crust: Remove butter from fridge and allow to soften. Combine the flour, salt and granulated sugar in a bowl. Cut the softened butter into cubes. Using a fork or pastry cutter or your hands, incorporate the butter into the flour mixture until the consistency resembles sand and tiny pebbles. Then use the palm of your hand to knead the mixture but do not overwork the dough. Form the dough into a ball and refrigerate for at least one hour. Preheat the oven to 375 degrees Fahrenheit. For this recipe, you will need a 9 inch ceramic pie dish that is 2 inches deep. *To prepare the filling: Peel the peaches and slice each peach in half and then slice each half into quarters. Remove vanilla beans from pod and combine with the paprika and cayenne pepper. In a very small saucepan over low heat, allow the teaspoon of brown sugar to dissolve in about 2 teaspoons of water until it turns into syrup. Combine the syrup with the lemon juice and spices. Place the peach pieces in a bowl and season with the lemon juice, syrup and spice mixture. *To assemble the pie: Remove part of the dough from the refrigerator and allow to soften for about 30 minutes. Using a rolling pin on a smooth surface sprinkled with flour, roll out 6 strips 9 inches in length and 1 1/2 inches wide. Place into the refrigerator to chill for an hour. Take out the remainder of the dough and allow to soften. Then roll out the dough to a thickness of 1/8 inch and cut it into a circle 12 inches in diameter. Then gently place the circle of dough into the 9 inch pie dish and crimp the edges. Fill the piecrust with the peach filling. *For the final touches: Place strips of dough on top of the filling using a braiding technique as explained on Smitten Kitchen's "latticed and loony" blog post. You will need to cut some of the strips to fit around the edges of the pie. Only a few strips crossing the center of the pie need to be 9 inches in length. 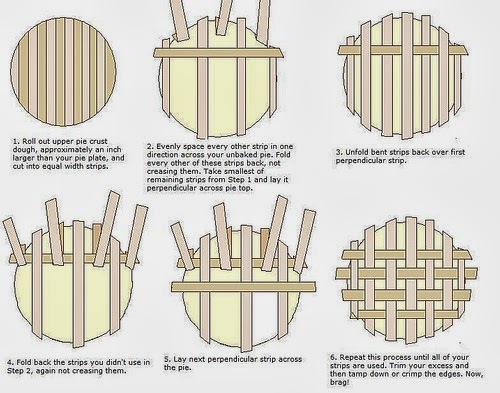 Adhere the ends of the strips to the crimped edges using water. Whisk together the powdered sugar and cream. Using a pastry brush, "paint" the crust and latticework with the cream and sugar mixture for a glossy, golden finish. *Bake at 375 degrees for 50 minutes to one hour, until the piecrust is golden brown. What a fun contest, Lisa. Your pie made a great showing, and I can't decide which I enjoyed more ... the filling or the crust! MMMMMM.